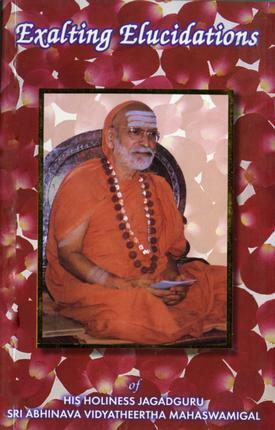 Here is a dialogue between the 35th Sringeri AchAryA, Jagadguru Sri Abhinava VidyAteertha MahAswAmin and a disciple, on the subject of fate and free will. This is excerpted from the book “Exalting Elucidations”, which is a collection of conversations, discourses, and incidents related to the Jagadguru on various topics including Dharma, Karma, Yoga, Jnaana, etc. पौरुषेण प्रयत्नेन योजनीया शुभे पथि || – 2.9.30. (The river of tendencies flows along the auspicious and evil paths. By means of self-effort, one should direct it along the auspicious path). Will AchAryAL kindly clarify the position? Thus it is clear that if we conquer likes and dislikes, we will no longer be under their sway. So, we should shed likes and dislikes and then voluntarily function in keeping with the scriptural teachings. You asked whether prArabdhA could be overcome. The reply is, “It can positively be overcome”. If it is that prArabdhA cannot be overcome, man cannot be held responsible for his actions at all. He would not have any choice. I earlier said that the karma that is now fructifying is prArabdhA. It is what we did in the previous births. Hence, prArabdhA cannot be stronger than effort. We can change the tendency created by our earlier actions by suitable extertion in this birth. However, if the tendency cause by the karma of our previous birth is very strong, we will have to put in a proportionally stronger effort to counter it. This is true in most of the cases. Of course, one’s freedom is not absolute. An illustration is a cow tethered to a post. It can roam about freely only to the extent of the length of the rope. It cannot go beyond. Similarly, the fate of the country, the free will of other people, and our former actions place a limit to our freedom. A person may board a train but the train may meet with an accident. In the same way, sometimes, one might have answered a question paper satisfactorily but the expected result might not materialise. One should not give room to worry on seeing all this. Almost anything may be attained in spiritual life by effort. One may be destined to be a householder but with the blessings of a Guru and by effort, one can lead the life of a brahmachArin and later, that of a samnyAsin. Though the consequences of earlier karmAs have to be experienced, the intensity of prArabdhA can be decreased by the grace of Ishwara. The negative effects of prArabdhA can also be reduced to a great extent by means of medicines, japa, homa, pUjA, dhyAna, and satsanga. D: If, according to one’s horoscope, one would live for eighty years, does it mean that one will not die before that? Similarly, if another is to have a very short span of life, can he not live beyond that age? A: The reply to your questions is in the negative. D: Does AchAryAL then mean that the horoscope is read wrongly or that casting of the horoscope is itself wrong? D: In that case, all that is predicted with the horoscope as basis is useless. Further, palmistry is not sensible. Hence no purpose is served by the Jyotisha-shAshtra. Is this AchAryAL’s view? D: Will AchAryAL kindly explain? A: The horoscope merely indicates the effect of karmAs that one had done in the previous births. In this birth, by exercising free will, we can definitely change the course of events. If we earn the grace of the Lord, like MArkandeya, then we can live longer than we are destined to. Similarly, by falling into evil ways, we can spoil our health and die earlier than we are supposed to. Further, we hear astrologers say, “If one acts as follows, the effect of that karma will be reduced”. If the verdict of the horscope is immutable, what is the use of such expiations? Nobody need to fear a horoscope. It is only an indicator of what is to come. We can certainly alter destiny if it is unfavourable. Another point to be remembered is that destiny can very well be favourable. In such a case, our efforts will readily bear fruit.